If you're looking for a go-to recipe to bake turkey legs, this is the recipe for you. 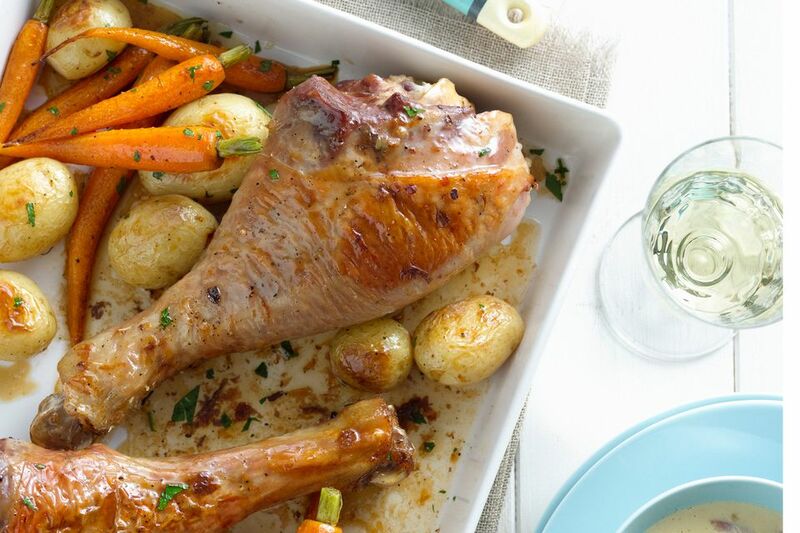 These turkey legs are baked to perfection, full of seasonings, and served with sliced vegetables for a healthy Southern meal that you can sink your teeth into. Gather the ingredients. Preheat the oven to 400 F/200 C/Gas 6. If thighs are attached, cut them away from the legs with ​a sharp knife. Rub the turkey pieces with the emon. Mix 1 teaspoon of the salt with the pepper, garlic powder, and thyme; rub over the surface of the turkey pieces. In a heavy skillet, melt butter over medium-low heat. Sauté onion in hot butter until tender, about 5 minutes. Stir in the carrot pieces, celery, potato, and remaining 1/4 teaspoon of salt, coating with the butter and onion mixture. Spread the vegetables evenly in a greased or sprayed 13x9x2-inch baking pan. Top with turkey pieces in a single layer. Heat wine in a saucepan just to the boiling point; pour over turkey. Bake, uncovered, for 1 1/2 hours, or until the turkey pieces are tender, and the juices run clear when pierced with a fork. If it is becoming too browned, cover the baking pan with foil.